Audioboom / "He Said, She Said"
A poll tax or not with James "J.W." Grant; David Straz's bizarre mausoleum; #BillsAreDying with POLITICO's Matt Dixon; Dance moms & a "Veep" recap. 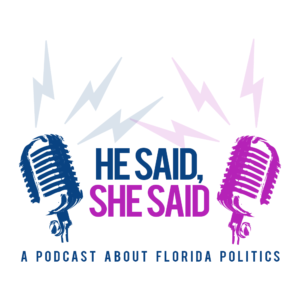 On this episode of He Said, She Said, Peter and Michelle welcome Rep. James Grant of Tampa. He talks Auburn basketball and all things Amendment 4: why implementation is necessary, the broiling national debate, and why constitutional amendments are dangerous. Peter catches up on the news from Tallahassee with Matt Dixon of POLITICO. Peter and Michelle go deep on Dance Mom culture, Ella's first dance competition, and why Veep is the funniest and most relatable show on television for any who has ever worked on a campaign.